One of the top challenges for small associations, clubs and non-profits that was identified in our 2014 Small Membership Survey was difficulty in recruiting younger members (AKA Millennials). But it’s critical for organizations to to find ways to connect with this generation since, as Derrick Feldmann (Achieve CEO and creator of the Millennial Impact Project) reports, there are “approximately 80 million Millennials in the world who will soon make up 50 percent of the workforce”. Companies need to build relationships with Millennial employees from the beginning to spark their passions and create opportunities to engage both their professional and personal interests. Employers should develop a triple platform of involvement – company-wide, department-based and interest-driven – through the workplace. 92% of respondents felt they were actively contributing to a company having a positive effect on the world. Beyond compensation and benefits, having their passions and talents used and fulfilled was the top reason for staying with a company (53 percent). 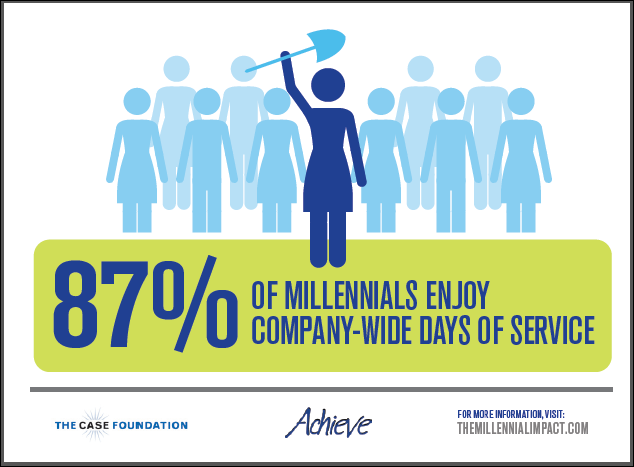 78% of Millennial employees preferred serving with a group of co-workers. Performing charitable projects with department or team. What are the implications for non-profits and membership organizations? First and foremost, this report offers insight for any organization looking to “build a bond” with Millennials – as members, donors, volunteers or employees. But the survey data also offers some insight into Millennials’ attitudes and preferences that non-profits and membership organizations can consider when trying to get this generation involved. Millennials want to use their skills for good. 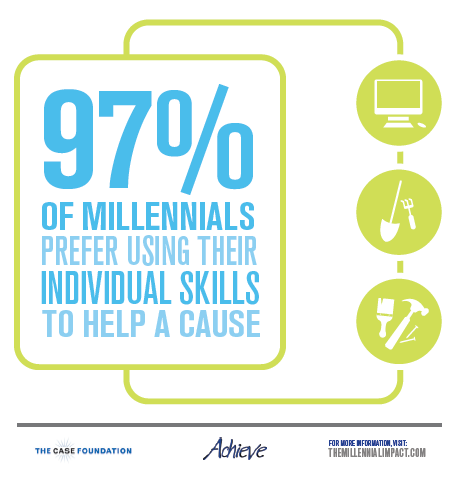 97% of Millennials prefer using their individual skills to help a cause. – To engage Millennial volunteers, identify volunteer roles that enable them to use their existing skills (including social sharing; virtual volunteering, etc.). 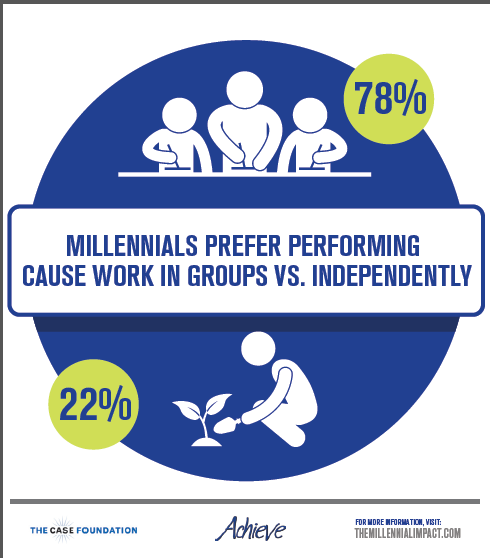 Millennial employees most appreciated cause initiatives that help their surrounding community – So reach out to those in your local area and be sure to demonstrate the impact of your work on the local community. Millennials volunteer with peers. Nearly half (47%) ... had volunteered for a cause or nonprofit in the past month ...44% had participated in company-wide service days, 44% had volunteered their skills to help a cause and 47% had done a volunteer project with their team or department. To take advantage of this trend, structure projects or volunteer roles that build and nurture volunteer or employee teams. Millennials ... view their network and voice as two very beneficial assets they can offer a cause. – Find ways to encourage Millennial staff and volunteers to engage their networks and establish social media policies so they can promote your organization on their social networks. – So it’s clear that your organization’s website is your key information gateway it should be welcoming, informative and easy to navigate. Offer a range of cause work actions. Allow Millennial[s] to perform both small actions from their desks, as well as larger projects with others, possibly off site. Tell stories and demonstrate the impact...show them who benefited from these actions and highlight individuals who made a difference. Are you “ready to inspire and engage a passionate culture of Millennials”? The millions of Millennials – 14 million 20- to 24-year-olds and almost 32 million 25- to 34-year-olds employed in the United States [alone] (Bureau of Labor Statistics) – are both your current and future members, donors and volunteers. Understanding and embracing their attitudes, preferences and expectations is the first step in getting “ready to inspire and engage a passionate culture of Millennials” and to solving your challenge to “involve the younger generation”. You can download The 2014 Millennial Impact Report here. Want additional insight into Millennials? Has your organization had success in engaging younger members? Share your tips in the comments below.